As a new shareholder, H.I.G. will support Beinbauer's management team in consistently driving its growth strategy by developing existing customer relationships and acquiring new customers. In addition, the Group is planning geographic expansion through organic growth and selective acquisitions in order to further expand its strong market position in Europe. Wolfgang Biedermann, Managing Director at H.I.G. Europe, commented: "Led by a dedicated and highly experienced management team, Beinbauer has shown strong development in recent years and demonstrated that it plays an important role as a reliable supplier to the European heavy vehicles industry. With its clear focus on offering its customers a highly flexible "one-stop-shop" solution, Beinbauer can further strengthen and expand its position in an attractive market segment of the European automotive industry." Dr. Johannes Schmittat, Managing Director at GCA Altium, commented: "Our team provided debt advice on all commercial aspects of the financing transaction and successfully secured the requested hold-co financing. 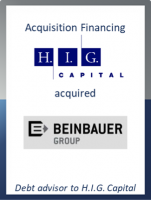 As a result of the implemented financing structure Beinbauer can grow both organically and via strategic acquisitions."